Google will launch their branded phone sometime in 2010. The device will be sold directly to customers as an unlocked GSM device. 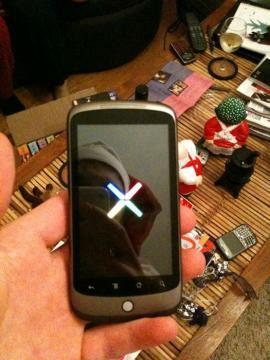 This means any SIM card, from any wireless carrier, should work with the phone. Details of the type of data plan the phones will support on each network are still unclear. Here’s the CNET article, which links to a number of other sources. 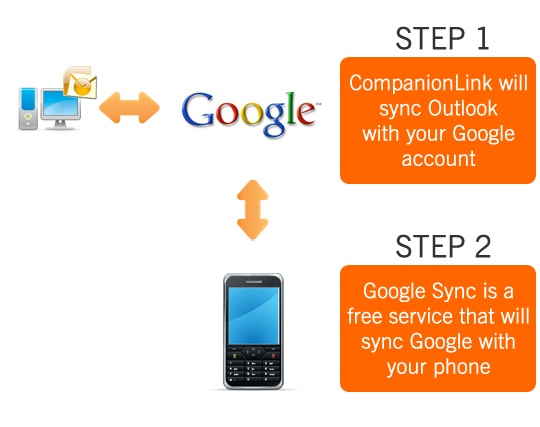 CompanionLink will support two-way sync between PC and Google Phone if the device – like all other Google Android-based phones – runs on the Android OS platform. CompanionLink will offer both wireless and wired sync. CompanionLink has a fix to the synchronization service outage with Google Calendar. If you sync calendar data from your PC to your Google Calendar, you will need to install this update. You can download the free update software here. Install this update on your PC. Make sure to download the software update for the product you currently have. If you don’t know which product you have, here’s how to find out. On November 24, 2009, Google made a critical change to a core field in Google Calendar. We don’t know if Google intended this change, or knows that it affects software that uses the published Google API. It may be the case that Google will allow the software to work again in due time. The change by Google to their published APIs made it unable for CompanionLink’s software to Add or Change Calendar information from PC to Google. Google Contacts is not affected. Sync Google Calendar works fine from Google to PC. CompanionLink has created a software update that complies with Google’s changes. CompanionLink products with build 3082 and higher will contain this change and can be used to update data from PC to Google. CompanionLink has been getting reports from users that as of today morning, their PC calendar has stopped synchronizing with their Google Calendar. CompanionLink was able to reproduce this problem with our in-house tests. We are working on a solution. Follow the CompanionLink Twitter feed for the latest updates. 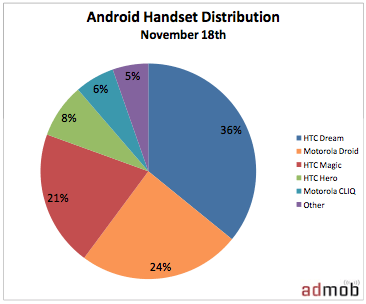 A week ago, CompanionLink unveiled their plans to develop USB sync software for Android phones. CompanionLink now has more details about the solution. 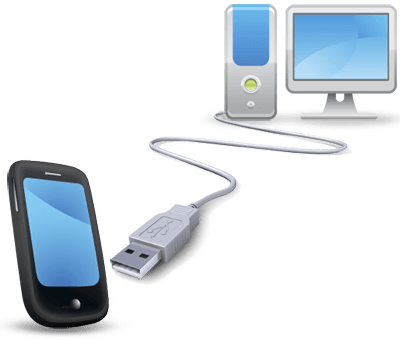 The sync will be ready for launch within 90 days and will do two-way sync of Contacts, Calendar, Tasks, and Notes between PC and Android phone using the USB cable that ships with the device. No web-based solution like Google is required. No Wi-Fi or Internet connection is needed. 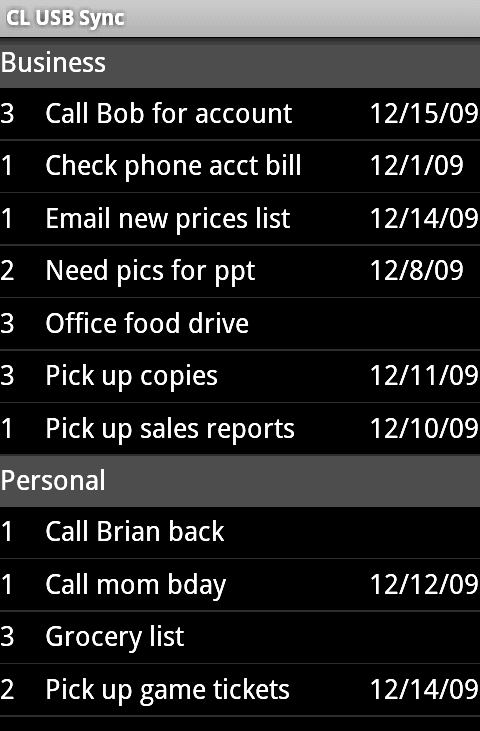 Contacts will sync to the built-in address book on the Android phone. 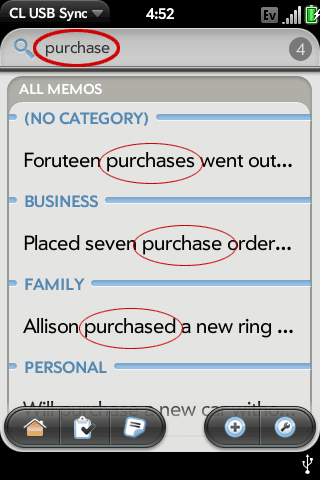 CompanionLink plans to include a way to categorize contacts into groups. Calendar will sync to a custom app that allows more search and list-view capabilities as compared to the built-in calendar on the Android phone. 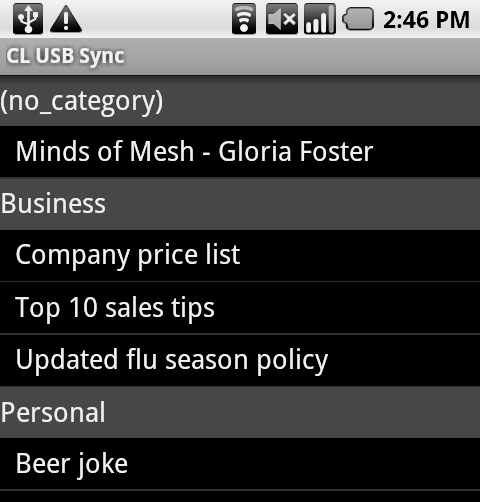 Tasks and Notes will sync to custom apps on the Android phone that will allow categorization, sorting, and the ability to assign priorities.